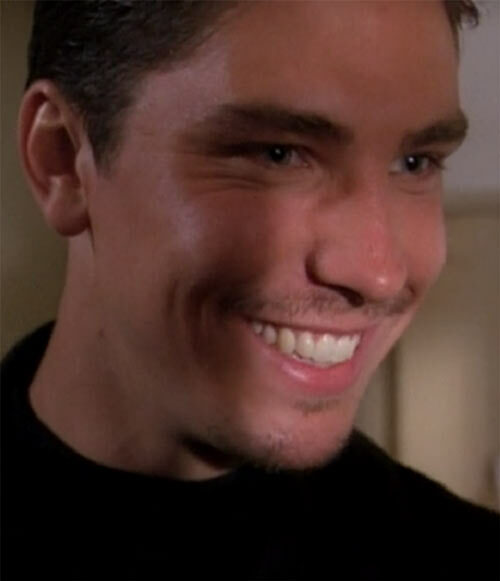 Michael Trucco portrayed Alec in the penultimate episode of Charmed season 1 (1998-1999). Charmed was a late-1990s/early 2000s TV serial about the mundane and magical struggles of three sisters who discover they are witches. They try to continue their normal lives while also using their powers to defend innocents against magical threats. Like several genre shows of the era, such as Smallville or Buffy the Vampire Slayer, Charmed often followed a “freak of the week” format . While the season might have over-arching themes and subplots, most episodes would feature a new warlock, demon, or other magical threat. That was Alec’s role, and as an obsessive super-powered stalker he could be a threat in many RPG campaigns. 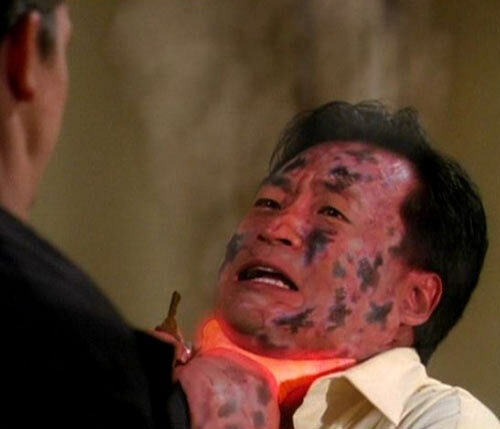 He was also the first Darklighter seen on the show. Witches on Charmed are aided by Whitelighters – something like guardian angels for witches. Darklighters are their opposite numbers. 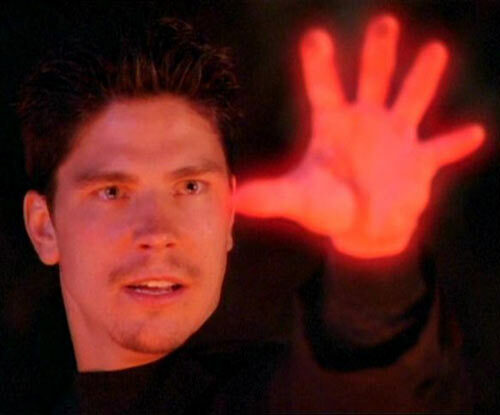 Over the course of its 8 seasons, several Darklighters appeared on Charmed, but Alec was the first and arguably one of the most powerful. Group Affiliation: Darklighters; the Underworld. Height: 6’3″ Weight: 220 lbs (estimate). In the Charmed universe, good witches are charged with defending the innocent (and themselves) from evil demons and warlocks. Their great allies are Whitelighters, deceased humans who did so much good in life that they are offered a second, magical life. Basically guardian angels, they function as guides and counselors to witches and Whitelighters-to-be. Darklighters are their opposite numbers, a breed of magical beings with corrupted versions of Whitelighter powers. Many Darklighters function as assassins, trying to weaken the forces of good by killing Whitelighters. Others are more insidious, targeting humans destined to become Whitelighters. They try to corrupt or subvert these paragons, preventing them from accomplishing the good they were meant to do and keeping them from earning their wings. Alec’s particular brand of Darklighter spreads evil through procreation. His brief is targeting mortal women who are destined to become Whitelighters. Rather than killing them, he attempts to seduce them and sire children who will inherit supernatural powers and a pre-disposition to evil. Near-immortality, as he is unaging and can only be killed by magic. A form of teleportation called “orbing”. The ability to sense the location of a few specific “charges” or victims. Alec could track and stalk Daisy, the woman he was obsessed with. He could sense her location and orb to her. The power to have a loaded crossbow appear in his hand in a puff of black smoke. The bolts are coated with a poison lethal to Whitelighters. With the exception of conjuring the crossbow, these powers are similar to those possessed by Whitelighters. Most distinctive is the ability of Darklighters and Whitelighters to teleport. When “orbing” they are surrounded by or sometimes seem to dissolve into a swarm of small colored globes of light. Whitelighters orb out in bursts of white and light blue; Darklighter orbs are black and dark blue or indigo. Sometimes these orbs will vanish instantly as the Darklighter teleports. At other times the orbs will remain visible for a few moments and be seen moving in the direction the user is teleporting. For instance, when teleporting out of a hotel room, Alec turned into a swarm of blue and black orbs that streamed toward the window before disappearing. Some Whitelighters have displayed an ability to “glamour” , or change their appearance. Alec displayed a similar power to alter at least some aspects of his appearance. He was not seen altering his face, though he might be capable of it. He could change his voice to mimic Daisy’s voice exactly. He could also change his outfit in the blink of an eye. One moment Daisy saw him dressed as a ticket taker in the bus station; she turned to run and found him behind her dressed in another outfit. She spun around and saw him watching her from a balcony dressed in his trademark black. It’s unclear whether he has a broader ability to create illusions or was simply combining his ability to teleport with his ability to alter his appearance. For simplicity’s sake I’ve assumed the latter, though if he was teleporting no one else noticed. Alec orbing away with a captive. Another minor power displayed by Alec was the ability to conjure fires. He did not use this in an offensive capacity, and may not be able to. Whitelighters have displayed abilities to summon light for illumination; Alec’s fire was likewise only used for illumination, and may be a less wholesome and more threatening version of this Whitelighter ability. Some Whitelighters have been able to create a nearly unlimited number of small, supportive magical effects that have little long-term impact but serve to comfort and help their charges. Examples include warming a drink, refilling a mug, or telekinetically opening a drawer. Extrapolating, Alec may similarly be able to conjure small effects that are not directly capable of hurting someone, but serve to intimidate and frighten rather than comfort and heal. This is just speculation, but would explain the mysterious fires he conjured when preparing to kill Daisy. Alec’s most dangerous power is in his hands. When he wills it, he has a touch of death which can kill a person in seconds. This is again a corruption of a Whitelighter’s healing touch. Alec is the only Darklighter to demonstrate this power. There is at least some evidence of Whitelighters who did not have healing powers when they started out, and developed them later. The death touch could likewise be a Darklighter power that develops over time. Note that while a Whitelighter’s healing powers are triggered by feeling love, Alec triggers his death touch with feelings of hate. 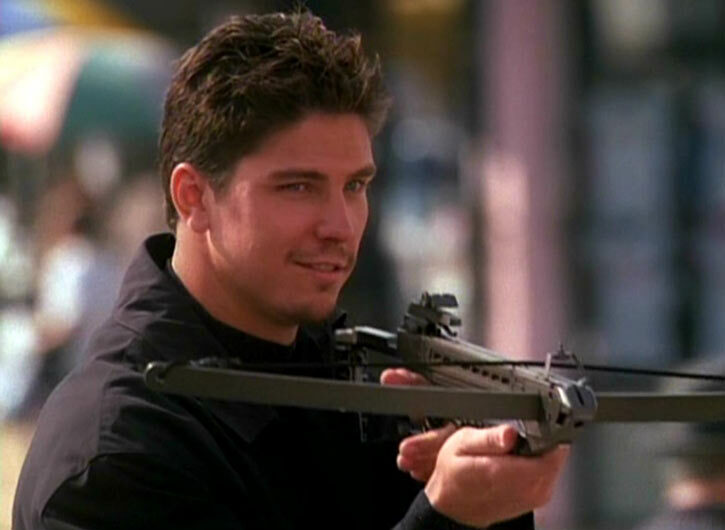 Alec is a decent shot with his crossbow. He’s also strong enough to grab an adult male by the neck one-handed and hold him helpless, at least long enough to use his death touch to kill the man. Here is a very brief sequence showing Alec’s death touch. Alec was a Darklighter, a nigh-immortal magical being assigned to spread evil through procreation. His mission was to seduce mortal women destined to become Whitelighters (guardian angels for good witches). He would corrupt or damage them to the point that they did not achieve that destiny, while simultaneously siring evil supernatural children. Then Alec became obsessed with Daisy, his latest target. He decided that what he felt for her was love, that she belonged to him and he would never give her up. So Alec revealed his real identity to Daisy and offered to make her his mate. Horrified, Daisy rejected him. She tried to flee, but with his powers Alec could find her wherever she went. Then Leo Wyatt, a Whitelighter assigned to watch over her, cloaked Daisy from Alec’s senses. He couldn’t sense or even see her. Unable to sense Daisy, Alec instead sought out Leo, who was meeting with Daisy in San Francisco. Leo assured her that he had “powerful friends” in the city who would help them. But Alec found them first. Daisy was still invisible to him, so Leo ordered her away while the Whitelighter confronted the Darklighter. Leo swore that Alec would never find Daisy while Leo lived. Alec smiled, conjured up a crossbow, and shot Leo with a magically poisoned arrow. Leo managed to orb away, but the slow-acting poison was deadly to Whitelighters. The poison began to spread through Leo’s system, weakening his power. Within a few hours, the cloaking magic began to fail and Alec was able to find Daisy in the cheap hotel where she was hiding. In a twisted imitation of romance, Alec left flowers waiting in her room. He orbed in behind her when Daisy saw them. He declared his love for her and his control over her. Daisy defied him, and the hotel manager investigated when he heard their argument. Alec used his death touch to kill the man, but Daisy fled out the window while Alec was distracted. Before Alec could follow, one of Leo’s “powerful friends” arrived and attacked. Leo had orbed to the Halliwell manor, home of the Charmed Ones. The three Halliwell sisters were witches, destined to become the most powerful witches ever seen. The middle sister, Piper, was romantically involved with Leo. Piper and the youngest sister, Phoebe, tended to Leo. Meanwhile the eldest, Prue, reached out to their friend Andy Trudeau, an inspector with the San Francisco PD. Andy traced Daisy to her motel, and Prue and Andy arrived moments after Alec had killed the hotel manager. Prue telekinetically hurled Alec across the room and into the wall. Nearly stunned, Alec orbed to safety. While Alec recovered and began trying to sense Daisy again, Prue returned home to check on Leo and her sisters and try again to trace Daisy. Piper cast a spell to swap her powers with Leo’s hoping she could trigger his healing powers and save him. But Prue and Phoebe were on the fringes of the spell, and their powers (telekinesis and precognition, respectively) were also switched. Despite the threat posed by Alec, Piper refused to reverse the spell until she could figure out how to trigger Leo’s powers. So Prue and Phoebe made do using each other’s powers and continued tracking Daisy. With Andy’s help, they learned Daisy had been to the bus station to buy a ticket out of town. But Alec tracked her there first, and used his powers to terrorize her. She fled to the bathroom and he followed. Prue managed to get a vision of Daisy there, and despite lacking fine control of her new telekinetic ability, Phoebe managed to knock him down and separate him from his crossbow. When Prue grabbed it and fired at him, Alec orbed away again. The Halliwell sisters took Daisy back to their manor to keep her safe, though once there, they had to argue with her to keep her from running again. Piper won the argument by pointing out that Leo’s sacrifice would be for nothing if she didn’t let the sisters help her. Alec nevertheless orbed into the manor, grabbed Daisy, and teleported them both away. He took Daisy to a stone altar he’d set up in Golden Gate Park. Since Daisy had now convinced him that she would never come with him willingly, he decided to kill her instead. But Piper tapped into her borrowed powers from Leo and was able to sense Daisy’s location. Prue and Phoebe arrived in time to intervene. 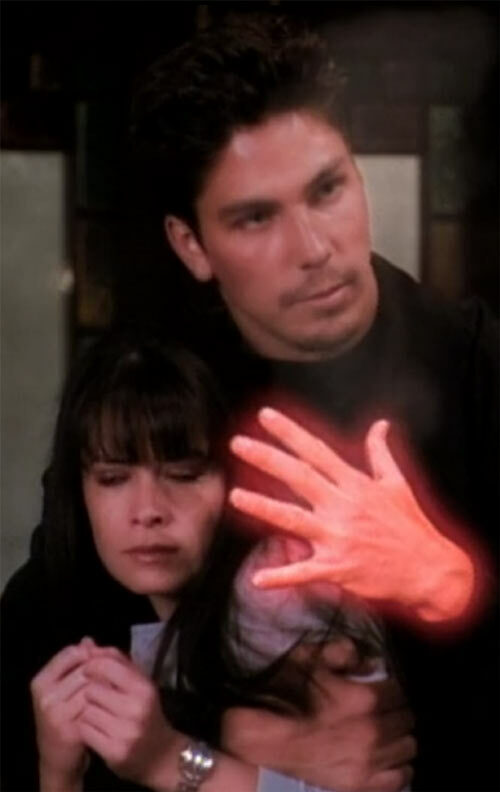 Alec prepared to use his death touch on them, but at Phoebe’s suggestion, Prue cast the power-switching spell, switching her borrowed power of premonitions for Alec’s powers. Alec could no longer kill with a touch and could no longer orb to safety. Before Alec figured out what was happening, Phoebe telekinetically dragged him to Prue, who used his own death touch to kill him. 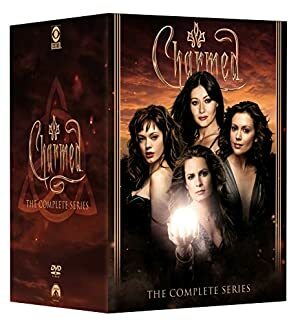 In his last moments, Prue cast the power switching spell again, reclaiming the premonition power for the Charmed Ones. Daisy was safe, Leo was healed, and the Charmed Ones restored their powers to their rightful holders. Alec is a tall and fit man seemingly in his mid-to-late 20s. 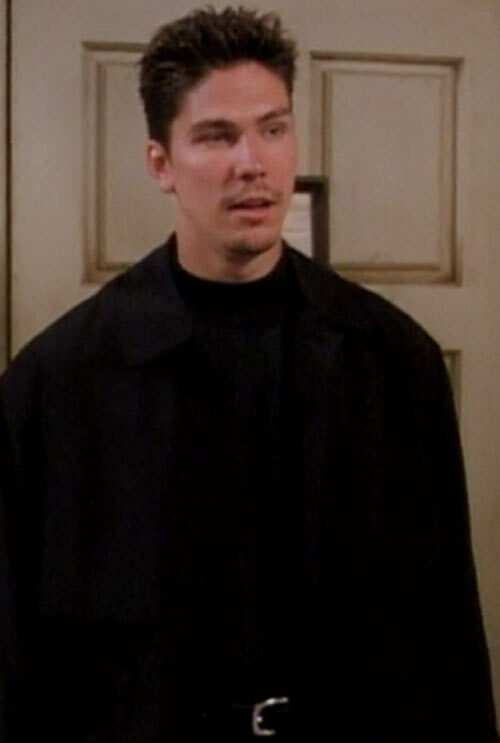 He has blue eyes, short brown hair, and a slight moustache and goatee. He’s reasonably attractive when he’s not sneering. He wore all black: a black turtleneck, trousers, jacket, and belt. 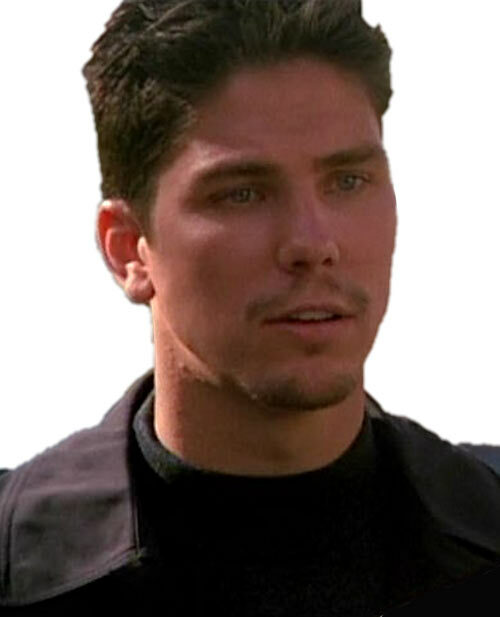 Alec the Darklighter was played by Michael Trucco, who has appeared in many roles on-screen but is probably best known for portraying Sam Anders on Battlestar Galactica. Alec’s very self-confident. He sneers and laughs at opponents, sure they are no match for him. He’s also completely ruthless, and kills without hesitation or remorse. He thinks he’s in love with Daisy, but his obsession is about control and possession more than anything else. He’s a classic stalker, leaving Daisy ‘gifts’ to let her know that he is watching her. And in the classic fashion of the abuser, he blames his violence on her refusal to obey him. There’s no reason that Darklighters couldn’t exist in the DCU or Marvel Universe as low-level demonic entities. No particular inspiration comes to mind though. Chameleon is only demonstrated to affect his clothes and his voice (-2). Flame Project has a Range of Touch (-1). Invulnerability does not protect against damage inflicted by magic (-1). Life Sense has a +7 Range like Teleportation (+1), but only detects Daisy or whoever is his current charge/mark. Area Knowledge (Underworld, presumed); Familiarity (magical world, Whitelighters, demons). None demonstrated. Presumably Low level connections to the demonic underworld. Poison Touch only attacks if RAPs are scored by EV (-1). Poison Touch damage is not healed by the Invulnerability of Whitelighters (+0, this is a Limitation of Whitelighters). Poison Touch only vs. Whitelighters (-1). Poison Touch doesn’t attack every Phase, successive attacks are every half-hour (-1). Poison Touch continues to attack even if RAPs are not scored in an attack, and can only be stopped if the damage done by the initial EV attack is healed (+3). Power Drain is Combined with Poison Touch and attacks every time Poison Touch does (+2). RAPs from Power Drain attacks are just lost, they do not get added to the crossbow or its wielder (-2). Alec appeared in only one episode, so his stats require some extrapolation. Source of Character: (the Charmed television show, season 1, episode “Love Hurts”). 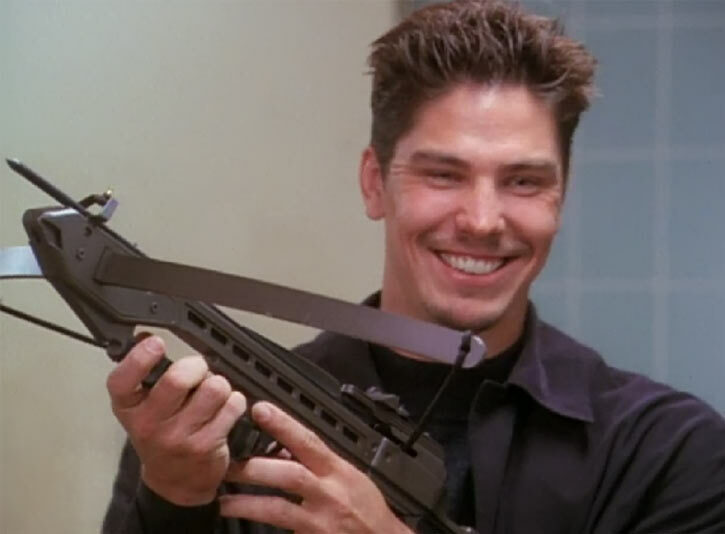 Helper(s): Ethan Roe (for various Charmed writeups used for benchmarking). Collected Charmed seasons (Alec appears in SE01EP21). 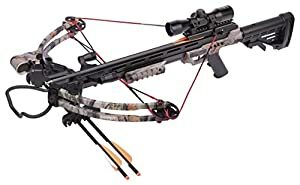 A crossbow (but not an evil one).